Spotlight falls on venture capitalist’s annual report. Features 355 slides regarding the state of the internet. Also recommended: The scariest Big Data development yet. In case you didn’t get the memo, the internet is a big freaking deal. So much so that it’s changed the way we eat, drive, shop, communicate — you name it! And it’ll change everything again in the next decade, too. With that in mind, each summer, venture capitalist Mary Meeker offers up her equivalent of the president’s State of the Union address. Forget all the pomp and circumstance, though. Her annual Internet Trends report is all slides. Lots of them. This year’s chart stack checks in at a staggering 355 slides — up 67% from last year. As I shared last week, it’s all “must read” material. Nevertheless, we understand few investors will actually take the time to review it. So each year, we distill it down to the most compelling and insightful charts. Consider it our public service. We started the process in last week’s column. In case you missed it, you can check it out here. To reiterate: The next major tech interface and revolution is about to be unleashed. It’s voice. The voice explosion is imminent, too. Not because all the major tech companies are introducing products, but because voice recognition technology is finally ready for prime time. 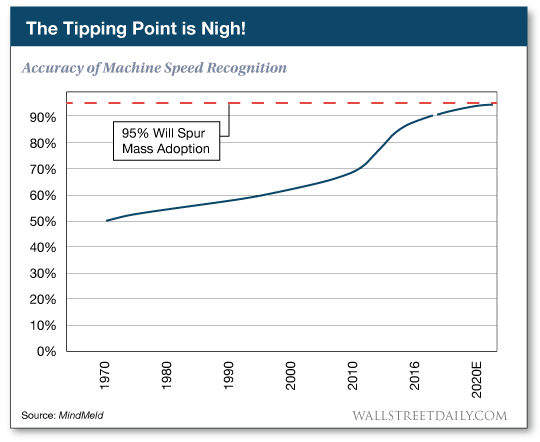 More specifically, it’s within spitting distance of being on par with human speech recognition capabilities at 95%. In March, IBM’s speech recognition team achieved a new record high at 94.5%. Indeed. The progress has reached a point where the technology is finally ripe for mass adoption — and, in turn, investment. We’ve chronicled the devastating impact Amazon is having on traditional retailers, forcing them to close up shop in droves. 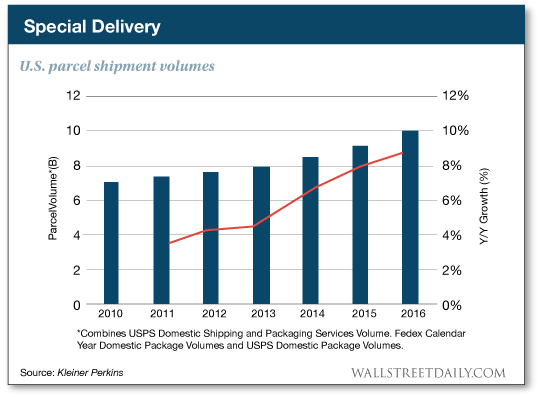 Parcel shipment volumes are up 9% in the last year. That’s more than double the growth rate from five years ago. Essentially, doormen are turning into delivery room supervisors. I’m guilty as charged here. Almost every day, a parcel arrives at my home. Increasingly, it contains mundane, everyday items. It’s so much quicker, simpler — and in some cases cheaper — to order it online with my Amazon Prime subscription than to go to a physical store. Since Amazon keeps entering new markets, this trend is likely to keep gaining speed. Bet on it! No, I’m not talking about the never-ending debate in Washington, D.C. I’m talking about the fact that almost all of our medical records are now online. In the last decade, electronic health record penetration rates for U.S. physicians catapulted from 21% to 87%. Once data are stored digitally, they can be accessed and analyzed exponentially faster and easier. Especially since more and more consumers are comfortable with the idea. Believe it or not, the majority of Americans couldn’t care less about digital privacy. I guess that shouldn’t be so much of a shocker, considering how much people already feel comfortable sharing on social media. In any event, another slide in Meeker’s report revealed that 60% of consumers are willing to share health data with Google, 56% with Microsoft and 50% with Apple. Permission will inevitably lead to products. The health and investment implications here are powerful and only beginning to be realized.